OCO owns STS Habitat System for ready deployment for safe hot work on production facilities. Within the petroleum industry, the term habitat is used to describe an enclosed area with overpressure. Habitats are constructed from flame retardant materials. The overpressure prevents flammable gas from reaching hot work (e.g. welding) inside the habitat and igniting. 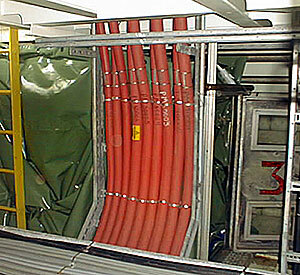 With an associated control and shutdown system, a habitat is able to ensure the safe execution of “hot work” in classified areas under normal operating and production conditions. Conditions in unclassified areas can also make it necessary to use a habitat. This recommendation assumes that a risk assessment has already been carried out, including an assessment of alternative methods (cold work, shutdown, etc. ), and it has been decided that a habitat shall be used. OCO ensure best practice by using Habitat System for hot work (e.g. welding) as appropriate on Oil and Gas production facilities.